Responsive web design is a way of designing and constructing a website so that different layouts are displayed for different size screens. It is called responsive design because the design of the webpage responds to the device being used to view it. Implementing responsive design allows us to better serve our website users – displaying a version of the website that is easiest to use, regardless of whether they are using a mobile phone, tablet device (like an iPad), computer or any other sort of device. 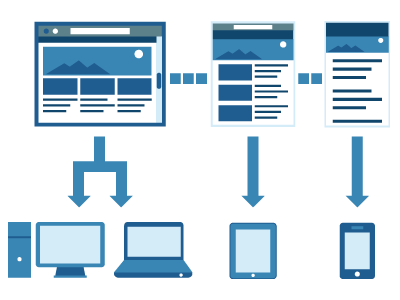 Responsive design is an approach that allows us to easily adapt to future needs – the variation of device sizes will only increase in the future and this technique allows us to easily cater for that. ANU will be moving to responsive design to better support a wider range of audiences, and to better prepare our website for the needs of the future. The rollout of the new design will be staged, with the ANU homepage and gateway pages converted first and then a progressive rollout to other sites using the current version of ANU web style. The overall style of websites will not change (we still use charcoal and platinum as our primary colours), but the layouts will change depending on what size screen you are using. Read the powerpoint slides (PDF, 1.2MB) or watch the video (MP4, 103MB) of the presentation on responsive design at the Web Publishers Group meeting on 13 March 2012. Please note, if using Internet Explorer, you will need to use IE10 or newer – the preview will not work in older versions. Responsive design has been implemented on the ANU gateway. Visit the pages, resize your screen to see the layout change, and try it out on different size devices.